A legal Notice should be used in most cases but especially when an exemption to vaccine requirements is difficult to obtain. Before you utilize a Vaccination Notice, it is important read as much information on this lawful strategy as possible. For instance, Word document templates to the most commonly sought Notices are posted at the Lawfully Yours! link. This is an important download to read and assimilate prior to spending time adjusting your Notice. Once you read this material, you will understand why their vaccine requirements, administrative rules, and/or state statutes may not apply to you and your family. School Vaccination Requirements, Exemptions and Forms – Who are they written for? any waiver forms before you sign. Find out why signing the AAP waiver form is a self incriminating act. Concepts regarding our legal system. All states allow a medical exemption and some states allow philosophical and/or religious exemptions. 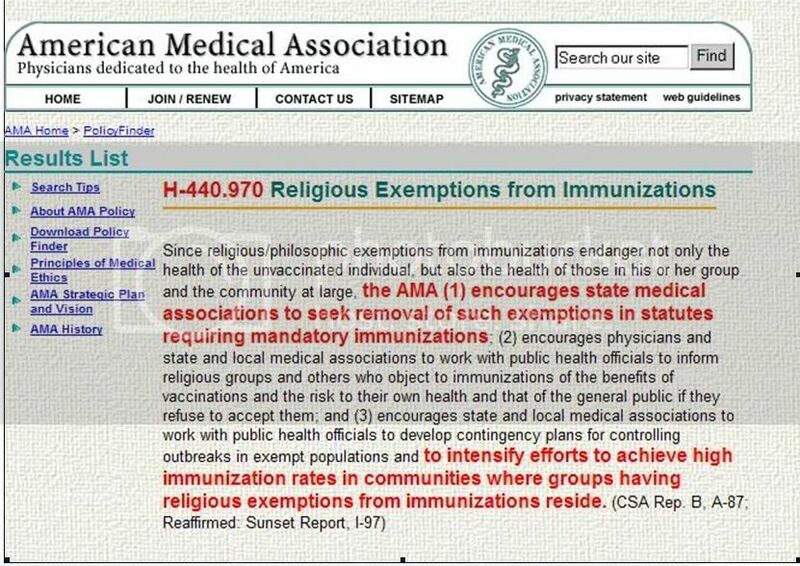 However, the American Medical Association and ChildrensHealthCare.org are actively promoting the abolishment of religious and philosophical exemptions. Likewise, other corporate fanatics are also challenging informed consent. Scroll down for links to General Information and Exemption Letters. Finding Physicians, including doctors who take non-vaccinated children. Can employees be forced to be vaccinated? "California: If you were not a health care worker, the answer would certainly be NO!" See above link for the "may be's" for nurses or doctors. Religious exemption information for most states in one document! Here is a great AFFIDAVIT that can be used for Daycare, Preschools and Schools. Warning: consult your state laws before modifying any form on our site. Some states require exemption requests to be in the language of the applicant. AFFIDAVIT for Colorado Older Child (preschool and school age). You can use this as a template for other states and simply replace the Colorado with your state and your state's statute. Please read the entire post about birth certificates as well. Edit for your state and insert your state's statute. You do not have to prove membership in any religion to use a religious exemption. How to write a letter for personal Religious exemption from immunizations. May encourage the belief that one is protected from the results of immoral behavior. *Note 1: Vaccinations are NOT Immunizations. *Note 2: Non-vaccinated does not mean Non-Immunized. Unvaccinated children have high degrees of immunity. Warning: consult your state laws before modifying any form on our site or writing an exemption letter. Some states require exemption requests to be in the language of the applicant while other states require a state printed form. Links to FindLaw and WashLaw legal search engines. Also "You May Also Contact Children of God for Life for Assistance in Filing A Religious Exemption in Your State. Please note that due to the large number of religious denominations, we cannot provide specific teachings for all faiths on this subject, however we will assist you with filing instructions and sample letters." http://www.cogforlife.org/ See link on left side of page. OSHA allows an exemption to recommendations for Hepatitis B vaccine for workers exposed to blood. "I understand that due to my occupational exposure to blood or other potentially infectious materials I may be at risk of acquiring hepatitis B virus (HBV) infection. I have been given the opportunity to be vaccinated with hepatitis B vaccine, at no charge to myself. However, I decline hepatitis B vaccination at this time. I understand that by declining this vaccine, it is alleged that I continue to be at risk of acquiring hepatitis B, a serious disease. If in the future I continue to have occupational exposure to blood or other potentially infectious materials and I want to be vaccinated with hepatitis B vaccine, I can receive the vaccination series at no charge to me." OSHAexemption.pdf Adobe PDF file for printing. "Interestingly, some other countries such as Canada and Mexico do not utilize mandates and have generally higher immunization rates than in the United States. However, in Canada there is universal health care coverage, including immunizations, and in Mexico very successful countrywide immunization weeks three times per year reach almost all of the children." Mexico has a very agressive "immunization" program. If you are going to live in Mexico and enroll your children in school, please enquire locally for the information about how to exempt your children and protect them from the "routine" vaccinations that often occur directly in the schools. 1) By law, everybody in México has the right to have access to vaccines. 3) It is Mandatory: Every registered Mexican child is granted a “National Vaccination Card” (which is actually a 3 page booklet), where their vaccination history has to be registered. A complete vaccination record, shown and validated in the National Vaccination Card is mandatory for being enrolled in public schools, as well as the most majority of private ones. New Zealand does not have compulsory vaccination or financial penalties for non-vaccinators (yet). They do require a vaccination certificate on entry into childcare or school. This is to identify non-vaccinated children during a disease outbreak. The following is an edited copy of a page saved from the AMA web site in March 2002. I am being asked to produce documentation of immunization for measles, mumps and rubella for a medical/surgical nursing job. My nurse colleagues and I have never heard of this required for employment to any hospital. Does an employer have a right to force an individual into getting an MMR vaccination for the sole purpose of employment? Look forward to your comments. Thanks. If you were not a health care worker, the answer would certainly be NO! But since the nature of nursing involves occupational exposure to infectious diseases, the employer might be able to ask about your immunization status and perhaps even to require re-vaccination if you do not have proof of current protection. Under the Americans with Disabilities Act (ADA), after an applicant is given a conditional job offer, but before s/he starts work, an employer may conduct medical examinations, regardless of whether they are related to the job, as long as it does so for all entering employees in the same job category. But, after employment begins, an employer may make disability-related inquiries and require medical examinations only if they are job-related and consistent with business necessity. Also, an employer may require employees to submit to medical examinations that are required by another federal law or regulation. 29 C.F.R. 1630.15(e)(1998) See: Enforcement Guidance on Disability-Related Inquiries and Medical Examinations of Employees Under the Americans with Disabilities Act (ADA). So, is immunity to measles, mumps and rubella either "job-related and consistent with business necessity" or required by other law? Maybe, according to our research at the Centers for Disease Control. The CDC report strongly recommends that health care workers be immunized for hepatitis B, influenza, measles, mumps, rubella, varicella zoter, and tetanus. Another federal agency, OSHA, says in its Technical Manual governing hospitals [Chapter 1. IV B 2. b] that: "Vaccination for rubella, measles, mumps, and influenza is recommended, especially for women of child-bearing age." [Note: [Chapter 1. III B 3.] also says, " A safety committee and/or infection control committee should be established within the hospital. Periodic inspection and monitoring is the responsibility of the safety committee. Immunizations, other than the mandatory vaccination for Hepatitis B, should be offered to personnel at risk." Thanks for raising such an interesting issue. We have only scratched the surface here. This would be a good question to pose to your state nursing society or professional board for a definitive answer. [Note: we updated links where possible and thus there differences between the above posting and the original file.